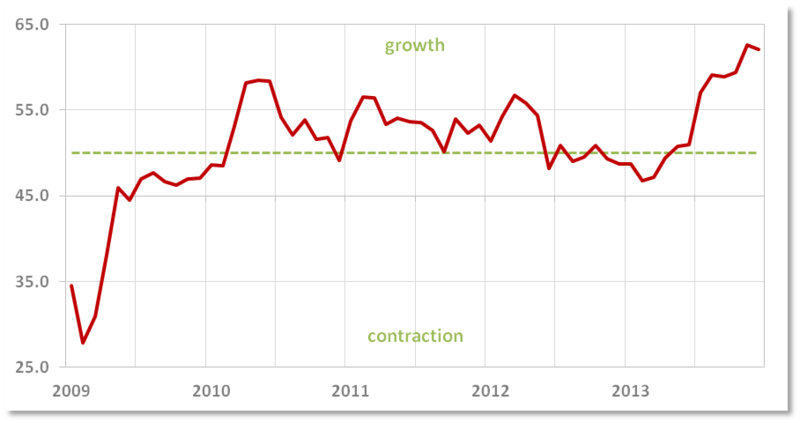 The UK’s construction industry saw its second fastest month of growth since August 2007 in December, with a PMI of 62.1. Although lower than November’s record high of 62.6, this has been the sector’s eighth consecutive month of growth, heavily boosted by the biggest increase in commercial projects since April 2007. With December's reading coming in slightly above economists' forecasts, residential activity remained the fastest growing sub-sector, although at a slower pace of expansion than in November. The civil engineering sub-sector increased at the same pace as the previous November but the real game-changer was the boost in commercial activity. In line with the positive figures, confidence was up with 57% of the survey respondents anticipating industry growth during the course of 2014 – a marked increase from one-in-three that expected growth this time last year. 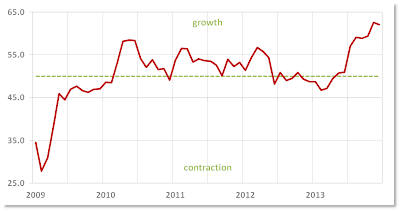 Employment rates have also improved and have been increasing for seven consecutive months. The construction industry’s latest signs of expansion also bode well for overall growth – Although construction only accounts for 6.3% of the UK’s GDP, it contributed around a quarter of total growth in 2013’s third quarter.